Unique dresser or accent cabinet perfect for adding a pop of colour into any room. This waist high cabinet is hand painted using high end chalk paint and several techniques including minor distressed details, to emphasize its trendy shabby chic style. The inside is a fresh light grey solid paint tone and the outside features a range of beautiful blues, light grey and white that fade into each other to create a customized “ombré” look. Great for the practicality of having extra storage while also bringing an eclectic charm. Can be used as a Childs Dresser, Accent Table, Hall or Foyer Table. Size: 22’’W x 12”D x 35”H Price: $180 Ask about custom orders. Pick up and Delivery Available Shop online or see the piece in person at ALLDECOR Group at Keele and Highway 7 / 407 in Vaughan. 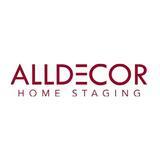 Contact us at 905-760-7676 or admin@alldecor.ca Private Showroom: Book an appointment to ensure availability of staff and product.